Boise Mayor Dave Bieter has joined forces with those wishing to go around the will of the voters who have twice turned down a convention center. Like his pals at G-BAD Bieter will not take “no” for an answer. After Judge Cheri Copsey declared it was up to voters to approve long term debt(for a police station), Bieter and the council pushed for a parking garage at the airport without voter approval. After spending tens of thousands of Boise taxpayer dollars pushing their illegal effort to go around the voters, city attorneys lost in the Idaho Supreme Court. That decision was issued April 13. 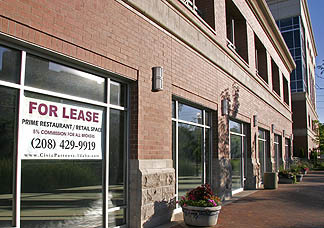 Now, Bieter is quoted in the daily paper saying, “I will push CCDC to to help with financing.” He reportedly has already asked the Capitol City Development Corp.–the city urban renewal agency–to explore plans to issue bonds for a convention center, similar to the plan used to finance the Ada County Courthouse. The Ada Courthouse deal has been subject of ongoing criminal investigations. It is one of the most complex deals ever perpetrated on the citizens of Idaho. Lawyers have been disgraced, a university president ousted, and after four years, ground floor space designated as income producing commercial area remains vacant. G-BAD lawyers erroneously advised the board it was legal to use public tax money to advocate one side of an election, despite pleas to the from citizens to the contrary. Like Boise City, they spent public money defending their illegal cause until the Supreme Court ruled against them earlier this year. No surprise, but behind-the-scenes maneuvering involves the J.R. Simplot family. They own most of the land in the area and have a “buy back” provision on the G-BAD land where voters have rejected a convention center. Even among the Simplots there is not a consensus for what or where development should take place. 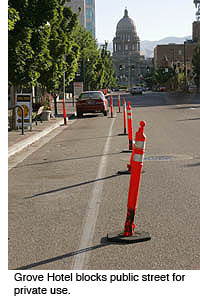 The sad reality is Boise Citizens have been ill served by local government. In their zeal to “build something” Boise City government has demonstrated a lack of direction, understanding, and integrity. ANYTHING built will yield NO REVENUES to the city of Boise–all the property tax on improvements goes to the CCDC which offers unfair subsidy to businesses downtown. In short the GUARDIAN and many others have lost confidence in the ability of these agencies to act on behalf of the citizens. It is time to disband the CCDC and let the free market prevail. Boise is not a “big city” and shouldn’t aspire to be one. The “small town feel” is what makes our city so appealing. The Grove Hotel encroaches on our public sidewalk, unfairly deprives motorists the use of our street as they permanently block a traffic lane of Capitol Boulevard. The Quest Arena events cause increased demand on public services–like police–but they pay NOTHING for police services…or any other city services. Meanwhile, Bieter and his Team Dave have asked Ada Commishes to expand the city area of impact into the desert south of town so sprawl can continue to ruin what was once a really neat place. The first question (of many thoughts) was about the Ada Courthouse and the indication of Boise Guardian that it was subject of ongoing criminal investigations, had disgraced lawyers, had ousted a university president, and that ground floor space remains vacant. Is it possible there’s confusion about the difference between the Courthouse and the University of Idaho project — which are in close geographic proximity to each other but not the same projects? (Just wanted to maintain credibility by being sure of the accuracy of the info). EDITOR NOTE–Good point. The projects are inextricably linked since the county owns the underlying land, CCDC has ownership of most of the buildings with leases to Civic Partners, and subleases back to the county etc. In fact, both the prosecutor and his assistant have been provided personal legal counsel at taxpayer expense. A virtual worm nest. What may also be a good point; not only are the projects linked, so are the people behind this sham. Seems the names that come up in one group, come up in the other groups as well. As usual it is who you know. What I can’t figure out just now is, what benefit is this thing other than money in the pockets of the various committees involved, the contractors, the vendors and a few others? Pleased with comments on Grove Hotel which is an unneeded intrusion on an otherwise charming downtown. Going against the wishes of voters is very much a campaign issue that should be used against politicans who pull these stunts. Who benefits? Probably big business. I thought the Popkey article today was quite good at examining all the balls in the air right now. Who knows how this will turn out, but frankly I’m glad to see a public/private partnership with some vision stepping up to make a better downtown. Regardless of much of the ranting in articles on this Blog, most public private partnershps are good for both the municipality and its citizens. With the exception of University Place, public/private ventures in this and other areas have resulted in real progress (yes there is a difference between growth and progress). Ya know what else, I reading the mayors comments about the CC financing I heard something very intersting. Just because the voters said no, doesn’t mean it shouldn’t be built. It just means they don’t want to pay for it with direct taxpayer funds. What I infer from what he said is that he wants to explore all the options. Remember guys private funds with public guarantee is a lot different than direct tax $ being used. One way to see when government forces an action that goes against the market is when you see government buildings that were suppose to be leased out and are not. Ala the courthouse and the apartments aound it. The fact is that the location and access to the courthouse is bad and so it sits unleased. Putting the space there in the first place had nothing to do with market needs – it was just someones grand scheme to justify it. The same thing will happen with the not needed convention center expansion. While there are self promoting, manufactured studies that GBAD says support their cause, the voters frankly know better and have voted as such. The only way GBAD can expand is by going around the voters and creating their own grand scheme. jon – how long have you been on the city payroll? 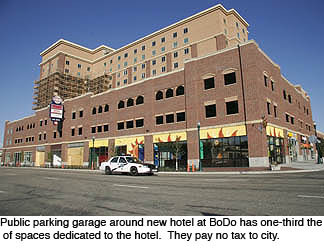 If one-third the parking at Bo-do is dedicated to the hotel then the hotel should pay tax on it – Or they should at least pay the tax to the CCDC. This situation smells like “rental car parking at the airport” – just a different public agency. Perry: Not on the city payroll. I’m just not myopic on these subjects and that is such a shock to the system of many who frequent these realms that they react emotionally. And another thing Guardian! Who cares that the hotel pays no taxes on the parking spaces? The people who park in those spaces are MORE than paying their way in the local economy. They land at our airport and they pay a fee in addition to their ticket. They rent a car and pay tax on that car. They spend money in our restaurants and pay tax on that food. They stay in the hotel room and pay a room tax. For the most part this is money being brought into the state from outside. The fact that the hotel pays no tax on those spaces is a boon to the vitality of downtown. In addition, the hotel generates jobs that run the gambit from minimum wage to six digit general manager jobs. Those employees pay taxes not only on their income, but on the goods that they then buy while downtown. The whole concept of tax incentives is to generate revenue and taxes tactically by cutting taxes strategically. EDITOR NOTE–Read again Jon. My problem is mostly with the unfair competition angle. The hotels at the airport, town square, Vista, ALL pay for their own parking. They don’t have taxpayers footing the bill for capital expense of covered parking. They may rent the spaces, but they don’t have any investment or taxes. Meanwhile the competitors pay for the parking, the cops, the fire etc. Also, hotel tax never reaches citizens at all. The time to do away with CCDC is long overdue. They are simply an enlargement of a self-serving bureaucracy and City government needs to remind itself that the People elected the government to do that growth and developmental planning work not CCDC. CCDC has already proven to be totally unresponsive to the People by it’s push for G-BAD, it’s involvement in the Ada county courthouse deals and it’s continual abuse of the public and the Vendors downtown by allowing private business’s and contractors to take over the sidewalks and endanger the streets of our fair city . Don’t forget that not one penny of any “improvements” made with tax payers money ever gets back to the tax payer. All profits are kept by CCDC to enlarge it’s Administration and operations. After all,They’ve got lot’s of “good ole boy” friends who want to live on the public dole. Editor, I respect your logic to a point, but all the hotel owners had a fair shot at the space that the Hampton will be in. Everyone (even the Ameritel guys)could have tried to get the management contract for this property. This advantage is really a function of the location (as you said) and frankly I don’t see a probelm with that. Not myopic? Wrong. Just myopic in the opposite direction, and seemingly buying the line of the pro-growth-no-matter-what groups. Think growth pays its way? Take a look at NYC, Chitown, Phoenix, Silicon Valley, etc. — check out their property tax rates, income tax rates etc. and see how well they do after astronomic growth. Maybe we can’t stop growth, but maybe we could stop the money-grubbers from constantly encouraging it and promoting it on our tax dollars. I guess my “buying the line” of pro-growther’s is no worse than so many of you “buying the line” of the out of state anti-tax lobby! In truth, I think what I see mostly on this board is a lot of people that care about Boise, but we just have a different vision of how to get to utopia. I mostly have to side with Jon (maybe not a surprise given my other posts). I may be mistaken, but the developers of BoDo still pay taxes on all the land they built up, but true to the tax-increment financing process, the tax proceeds are diverted to retire the private-sector debt acquired to build the surrounding public amenities. These include improved roads & signals, sidewalks with street trees, rehabilitated underground infrastructure capacity (not all of which is required by the development), not to mention removing and cleaning all the contaminated soil on the site (this site was a rail freight transfer yard for years, and during that time there were thousands of gallons of diesel fuel & oil dump on the ground). Once this debt is retired, the tax income is re-diverted back to the public’s coffers. These improvements were badly needed today, but rather than wait until all the tax funds were saved up (and dealing with the misery of decrepit infrastructure in the mean time) the developer pays for (and builds) it all today. Because the FREE MARKET upfronted the money to make these improvements – and rightly requires that the money be paid back over time – the public benefits today, and realizes an increased taxable land base as the debt is retired. Otherwise, with no improved infrastructure and no way to finance it there would be no private-sector reinvestment in the area – with no such investment, the public languishes under the oppressive debt of deferred infrastructure maintenance & capital improvements, and a contaminated environment. And, the public never realizes an increased tax base. Does such financing tilt the level playing field that all private business is suppose to be playing on? To believe that, you would have to first believe that such a level field even exists. Hint, hint. nudge, nudge, wink, wink… it doesn’t. Is the redevelopment of a city’s downtown city core a necessary component of a vibrant community? Only if you treasure a vibrant downtown. I suspect many who oppose an urban renewal agency & its core mission don’t burden themselves with this belief. Is the use of public taxes to intice private-sector reinvestment a legitimate expense? It depends on 1) the terms of the deal, 2) the size of the public benefit, and 3) the number of people who will benefit from the reinvestment. To answer the first factor – the deal makes sense if the amount of interest the tax-increment financing arrangement pays is near-equivilant to the interest on bonded debt. To answer the second factor, the deal makes sense if the physical size of the improvement and the demand for the improvement match a previously published infrastructure deficiency report. To answer the third and final factor, the deal makes sense if the residential and employment base which will enjoy an improved urban fabric is large enough. As for BoDo (a seriously crappy name, the developer’s PR group should be fired), it appears to meet all these criteria. Access to the north side of Front Street (the Courthouse Corridor area and points west) is very restricted. This is because it is served by a five-lane, one-way arterial – access onto which is further restricted by the Idaho Transportation Department (not ACHD), because it is a state highway. This alone is enough to scare private businesses away. Any development that has service & customer access to both Front AND Myrtle at least has a chance at survival – look at Winco, and the office building in which George’s Bicycle is located, and maybe BoDo (if the financial projections are honest). This benefit would also hold true for the proposed Convention Center – and why the current “single-loaded” CC site suffers so poorly. The very fact that the existing CC was built at “Center-on-the-Grove” was an act of extremely poor urban planning. That Boise’s Chinatown was condemned and demolished to make way for the “Center”, by CCDC’s predecessor (the Boise Redevelopment Agency), was urban renewal at its height of criminal arrogance. And, that the couplet was extended into the heart of downtown is nothing more than a knife at the juglar of the city. These events have all come to pass, the best we can do is correct the mistakes of the past and do so in the most cost effective way possible. EDITOR NOTE–George, you got it right for the most part. However, these people don’t play fair. The continue to expand their horizons, create new “districts” and then refinance the debt and extend it. Greed drives their development decision–hence mega plans like the defunct tower because they figure it will yield more revenues. You could have a “vital retail” outlet with two stories of offices over the Boise Pit, but CCDC holds out for grander plans. I am no longer willing to pay for all the services they consume. Ain’t that just WONDERFUL?!!? (/sarcasm) What would we have to do to get on the list with Detroit, East St. Louis, Gary Indiana, and Yuba City? I’d rather be on THAT list. Ironically, the “cons” they see about living in Boise is spiraling property taxes and “sprawl.” How will those problems be impacted when 500 more families pull up their California (or elsewhere) roots and aim the U-Haul toward Boise? If the Convention Center is a great idea, maybe the Simplots can build it as a private venture. They’ve got money. They could incorporate a wing for the J.R. Tractor Museum, and for the expanded Discovery Center. Well, I’ve heard that both U-Haul and a national moving company (United Van Lines?) have listed Boise, Idaho as one of their “top destinations” in the country, based upon sales and rentals. I’m glad there are so many people left in the US with that ol’ pioneering spirit. Remember the stories that grandpa used to tell about pulling up stakes during the 30’s and looking for prosperity? Its seems that a few generations on and grandpa’s decendents have gotten a little too comfortable and would prefer that things never change. Isn’t this just another form of undeserving entitlement? In my way of thinking, these emigrant-phobes are even worse than “welfare queens”! What’s wrong with progress and change? What’s wrong with our community inspiring a little yankee ingenuity and why wouldn’t we open our arms to newcomers? I can guarantee you that those who are moving to this area are willing to work, and willing to invest their hard-earning money in this area – to become members of our community. And remember, no matter how hard you wish, you don’t have the keys to the city gate. Playing ostrich and refusing to confront & facilitate growth will only result in a socioeconomic calamity of such epic proportions that it would make the financial doldrums of the 70’s seem like a walk in the park. Does anyone think that we’re that comfortably insulated from the possibilities of race riots, rampant unemployment, run-away home foreclosures, or urban decay? Trying to turn away emigrants, or adopting policies and laws that make our communities unattractive to newcomers, is the equivalent of cutting our nose off to spite our face. Personally, I don’t think we should be hoping to carry the full tax burden of fixing all our communities’ problems by ourselves. I look forward to spreading the load. Rumor has it that, by 2008, there will be an effort to repeal Boise City Ordinance #4778 (which created the board of CCDC), therefore holding our city council members accountable as the board members of our Urban Renewal Agency. The city council members currently hide behind the nine-member board of CCDC with no oversight and, as a result, have no accountability. Currently, our mayor appoints the board members. Talk about stacking the deck! When the most recent vote for the convention center came around, my sage father pointed something out: If the convention center is such a good idea, and such a guaranteed money maker, they should not need taxpayer money at all; a private investor should be more than willing to foot the bill for such a sure thing. The fact that private investors have not stepped up to the plate suggests to me (and my father) that maybe it’s not such a sure deal and we might consider other uses for the land. Boise Redevelopment Agency, predessor to the CCDC, bought up most of the buildings downtown, many from the Broadbent family which had owned and rented out spaces for decades, and made a tidy profit for the Broadbent heirs. Personally, I don’t understand why CCDC is still operating. And I agree that if a convention center is good why doesn’t one of the wealthy people in the valley build it? If you’re not a part of the solution, there’s good money to be made in prolonging the problem.